The footballer was initially charged with stealing juice but the court accepted that was a 'misunderstanding'. 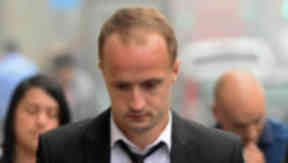 Former Hibs player Leigh Griffiths shouted, swore and struggled with staff at a Tesco when they accused him of stealing juice. The 23-year-old striker was initially charged with stealing water and juice from the shop in Meadow Place Road, Edinburgh on January 26 this year. He was also charged with trying to punch a member of staff and committing a breach of the peace. At Edinburgh’s Justice of the Peace Court in Edinburgh on Thursday, Griffiths’ not guilty pleas to the theft and assault charged was accepted by the Crown. The player admitted shouting and swearing at staff and struggling with them. Defence solicitor, Kathleen More, told the court Griffiths had been due to catch a Hibs team bus to Aberdeen and went into the store to buy some juice for the journey. She said: "He purchased these items and then made to leave the shop. As a result of a misunderstanding, when he tried to leave the shop he was stopped by a member of security. "Fearing he was going to miss the bus, he over-reacted". Justice Robin Vaughan said he accepted there had been a misunderstanding. He added: "That does not excuse you losing your temper, swearing and struggling with the shop staff."